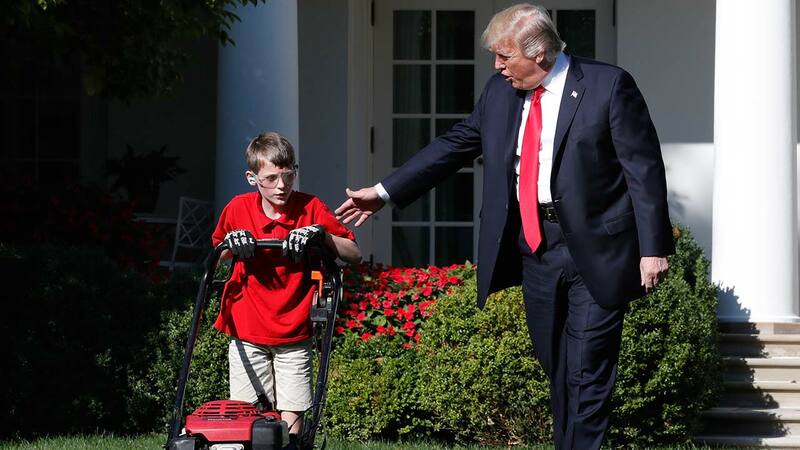 WASHINGTON -- An 11-year-old boy in khaki shorts and a red polo shirt got the lawn-mowing gig of a lifetime Friday when President Donald Trump put him to work in the Rose Garden. Frank Giaccio, who goes by the initials FX, was so focused on doing his job that he didn't even notice when Trump emerged from the White House to check out his work. When the boy finally paused, the president called him the "future of the country right here" and asked what he wants to be when he grows up. "A Navy seal!" Trump exclaimed. "Well, he'll make it." Standing with FX and his father, Trump added: "We'll bring them into the Oval Office. Maybe he'll be president." Just how did FX make it to the Rose Garden? The White House said FX had written to Trump to say he admires the president's business acumen and runs his own neighborhood lawn-care business. "It's probably the biggest day of my life so far," FX said afterward. He added that his day was "jam-packed" with media interviews, watering plants, mowing the lawn and visiting the Oval Office with his dad. "It was a lot bigger than I thought," he said. According to a letter that White House spokeswoman Sarah Huckabee Sanders read to reporters, the boy wrote that it would be his "honor to mow the White House lawn." He also enclosed a menu of his services, which include weed-whacking. "My dad didn't think I was going to meet the president at all - I was just going to mow the Rose Garden. But the president came by and said hi," FX said. Trump later tweeted: "THANK YOU for doing a GREAT job this morning! NatlParkService gives you an A+!" The tweet included video highlights of FX's White House visit - complete with a photo of him posing with his elbows on the Resolute Desk in the Oval Office next to Trump.